by Bill Dwight on Wednesday, December 18, 2013 at 7:34 PM | LEAVE A COMMENT! It’s down to the wire, and you need to find a quick gift for a kid. Maybe it’s your own child. Maybe it’s a grandchild, a niece, a nephew, or a godchild. Perhaps it’s the child of a good friend or relative. Think. Think. What’s the easiest last-minute gift that kids of all ages are sure to love? Yech, that doesn’t feel quite right. Yeah, that feels right. Perfect. So how do you do give money to a kid in that way? With FamZoo. 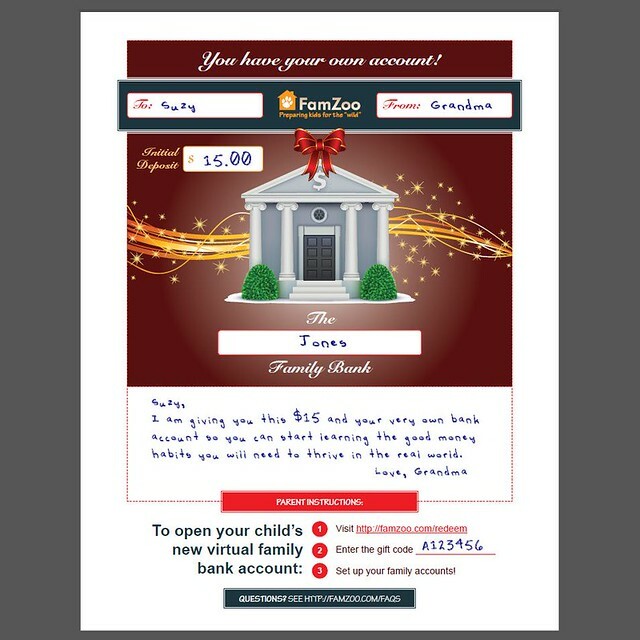 Give a gift subscription to FamZoo.com, and, optionally, some starter cash as an initial deposit. What is FamZoo? It’s a virtual family bank that fills the gap between the rudimentary piggy bank and adult-oriented banking products like checking accounts and credit cards. 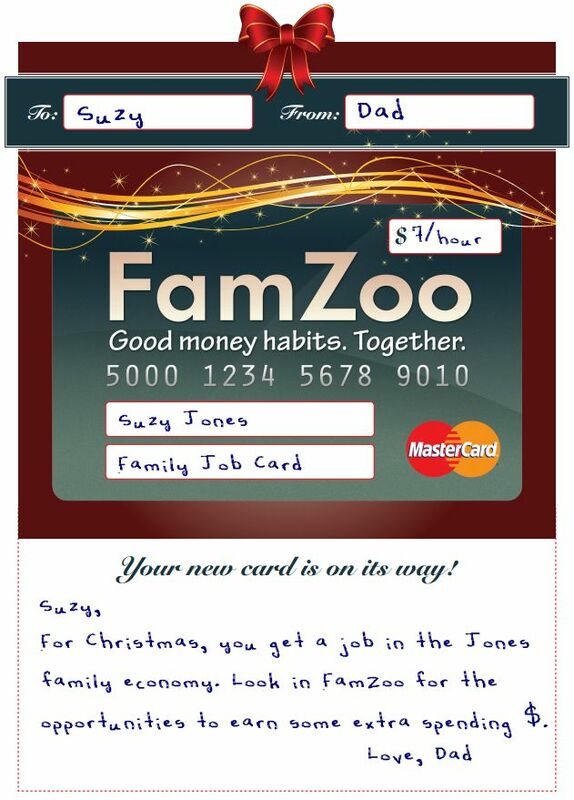 FamZoo supports both IOU accounts and prepaid card accounts. For eligible US families, up to 4 prepaid cards are included in a FamZoo subscription at no extra charge. FamZoo is specifically designed to help parents teach kids good money habits in a hands-on way. Think of it as training wheels for online banking. In other words, you’re giving a kid some money wrapped in an ongoing financial education. Questions? Learn all about FamZoo here. Buy a FamZoo gift subscription. What’s the best way to present a FamZoo subscription to a kid or a family? Here are some ready-made printable templates along with some suggestions for how you might fill them in for some common gift scenarios. Click here to download printable template. Do those examples match your situation? Do you need a tweak to a template or a different style? Do you have suggestions for improving the FamZoo gift experience? Do you have a fun sample you’d like to share with us? We’d love to hear from you!